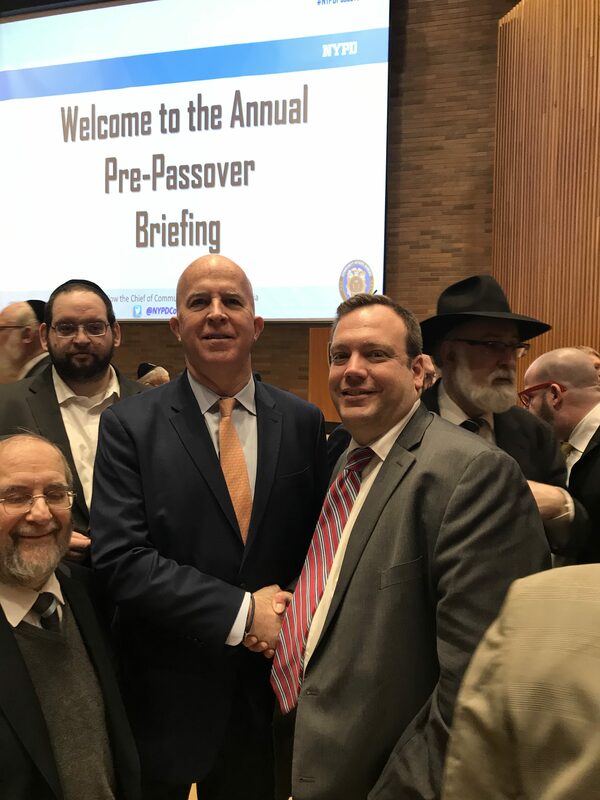 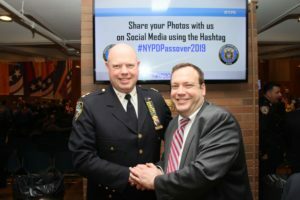 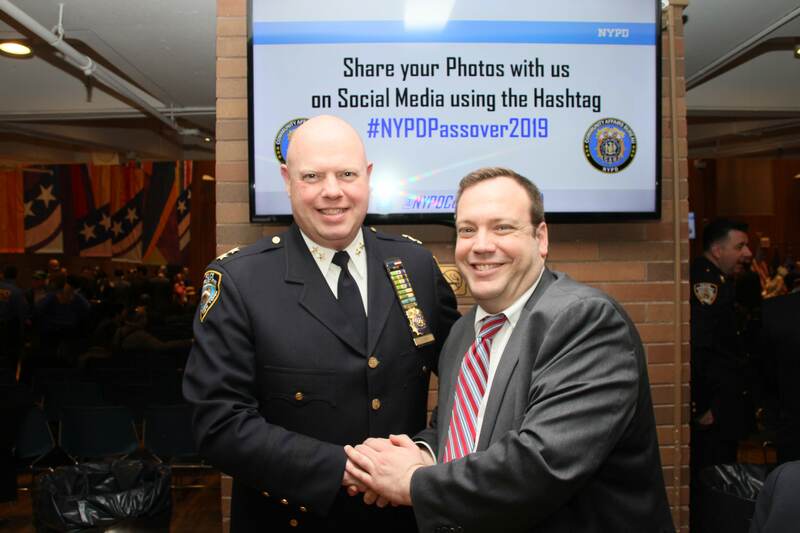 ( L-R) NYPD Commissioner James P. O’Neill greets and welcomes Rabbi Mendy Mirocznik, president Council of Jewish Organizations of Staten Island at the 4oth Annual Pre-Passover Briefing. 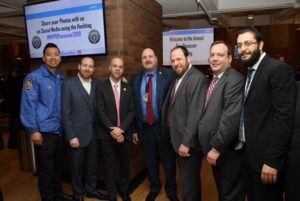 Officer Tran, Patrol Borough Brooklyn South; Mr. Ari Weiss, coordinator Staten Island Shomrim and chairman Security Committee Council of Jewish Organizations of Staten Island; Detective Adam Berish, liaison NYPD Commissioner James P. O’Neil’s Office; Detective Dominick Scotto, liaison NYPD Commissioner James P. O’Neill’s Office; Rabbi Mendy Mirocznik, president Council of Jewish Organizations of Staten Island; Rabbi Dov Zeitlen; and Rabbi Yaniv Meirov, operations manager Chazaq Organization. 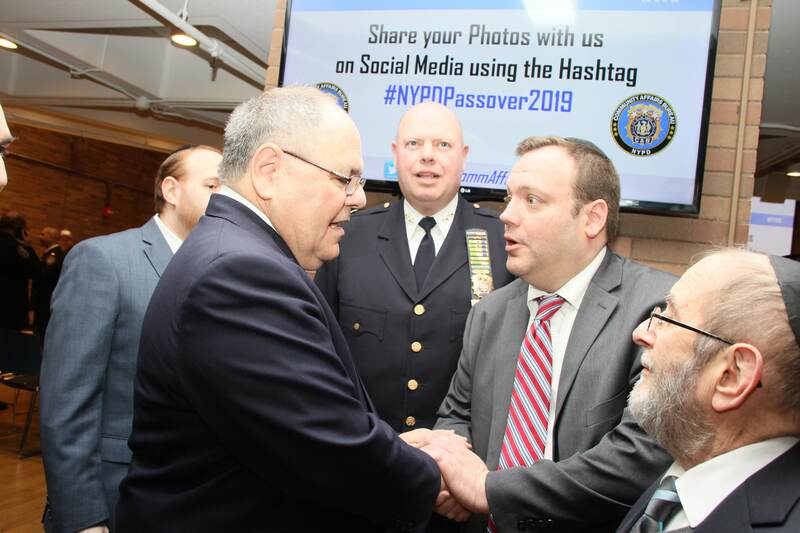 Ambassador Dani Dayan, Consul General State of Israel New York greeting Rabbi Mendy Mirocznik, president Council of Jewish Organizations of Staten Island; Chief Kenneth Corey, commanding officer Patrol Borough Staten Island standing in center and Rabbi Yehuda Blank, director Chaplaincy Commission, Rabbinical Alliance of America/Igud Harrabonim and former New York City Housing Police Chaplain standing at Rabbi Mirocznik’s right. 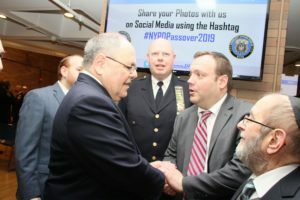 Chief Kenneth Corey, commanding officer Patrol Borough Staten Island and Rabbi Mendy Mirocznik, executive vice-president Rabbinical Alliance of America and president Council of Jewish Organizations of Staten Island.